The US Office of Special Counsel determined that the White House counselor Kellyanne Conway violated federal ethics laws twice when she advocated and opposed Senate candidates. 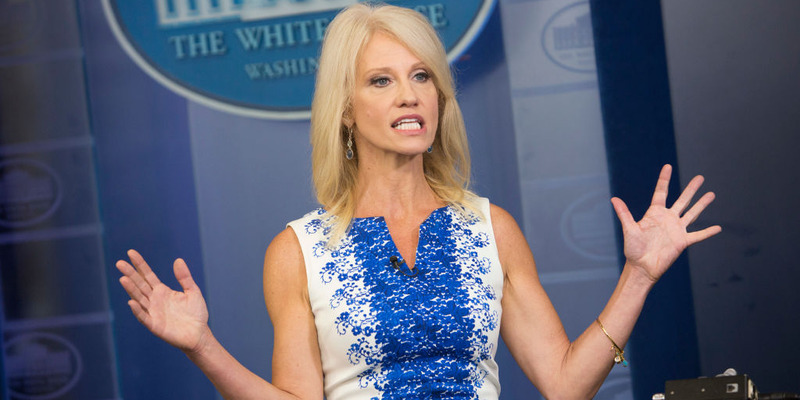 Ethics experts say those findings, along with a previous ethics violation, warrant Conway’s firing. The White House, however, has denied that Conway engaged in political advocacy. The US Office of Special Counsel has determined that the White House counselor Kellyanne Conway violated federal ethics laws twice when she advocated and opposed Senate candidates during television interviews last year – violations that ethics experts say warrant Conway’s firing. Special Counsel Henry Kerner, who was appointed by President Donald Trump, argued that Conway repeatedly violated the 1939 Hatch Act, which bars government employees from using their position to advance or promote political parties or candidates, even after receiving “significant training” on the law. “So, vote Roy Moore?” the “Fox & Friends” host Brian Kilmeade asked, referring to Jones’ Republican opponent who was – and still is – facing multiple allegations of sexual misconduct. Conway made similar comments in the second interview, on CNN on December 6, even after receiving public criticism for her statements on Fox News. The special counsel turned its investigative report on Conway’s violations over to the president, who will decide whether and what kind of disciplinary action should be taken. But in a statement, the White House defended Conway’s comments. Richard Painter, who served as the White House’s chief ethics lawyer under President George W. Bush, said it was unprecedented – at least in the past few decades – for a White House to deny the findings of the independent ethics office. Walter Shaub, a former head of the Office of Government Ethics who served under both Trump and President Barack Obama, argued that the violations were indisputable. The Campaign Legal Center, which Shaub now leads, filed a complaint against Conway. The Office of Government Ethics recommended the White House investigate and potentially bring disciplinary action against Conway for touting Trump’s daughter’s business, but Conway never received any disciplinary action. Trump crossing an ethical red line? Norm Eisen, who served as the top ethics official for Obama,tweeted on Tuesday that the president’s dismissal of Conway’s latest violations would constitute crossing an ethical red line. Kathleen Clark, an ethics law professor at Washington University in St. Louis, said Conway’s silence on the issue was troubling. “It makes one question whether she even understands her responsibilities as a public official,” Clark told Business Insider. Conway is not the first administration official to be found in violation of the Hatch Act. In early June, the Office of Special Counsel issued a warning to the White House social-media director Dan Scavino for having in April advocated on Twitter the electoral defeat of Republican Rep. Justin Amash of Michigan.